Includes the names: E Peterson, Eugene Peterson, Eugene Peterson, Eugene H Petersen, Eugene H. Peterson, Peterson. Eugene H., Eugene ed. Peterson, etc. Eugene H Peterson, Eugene H. Peterson, ed., Message text by Eugene H. Peterson ... (see complete list), Peterson Eugene H. Peterson Eugene H.
Eugene H. Peterson is professor emeritus of spiritual theology at Regent College, Vancouver, British Columbia and was the founding pastor of Christ Our King Presbyterian Church in Bel Air, Maryland, where he ministered for 29 years. Eugene has authored more than 20 books including Run with the Horses (IVP), A Long Obedience in the Same Direction (IVP) and his five-volume series on spiritual theology, beginning with Christ Plays in Ten Thousand Places (Eerdmans). Peterson is fluent in Hebrew and Greek and is the translator of the best-selling Bible, The Message. Eugene H. Peterson is currently considered a "single author." If one or more works are by a distinct, homonymous authors, go ahead and split the author. 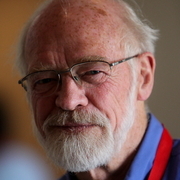 Eugene H. Peterson is composed of 12 names. You can examine and separate out names.